The youngest to win a major, when at age 20 he won the US Open. 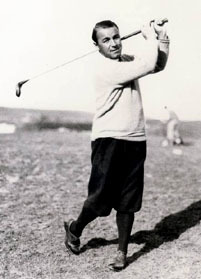 Sarazen's major wins were the US Open (1922 and 1932), the British Open (1932), and the PGA Championship (1922, 1923, and 1933), and most famously, the Masters Tournament (1935). This last win made him the first to achieve the "Grand Slam", something only five golfers have accomplished in the history of the game. His earnings in 1932 were $42,000, extraordinary pay for a sports figure at the time. He is the inventor of the "sand wedge" club (1930). After retiring Sarazen was a commentator for the Wonderful World of Golf.